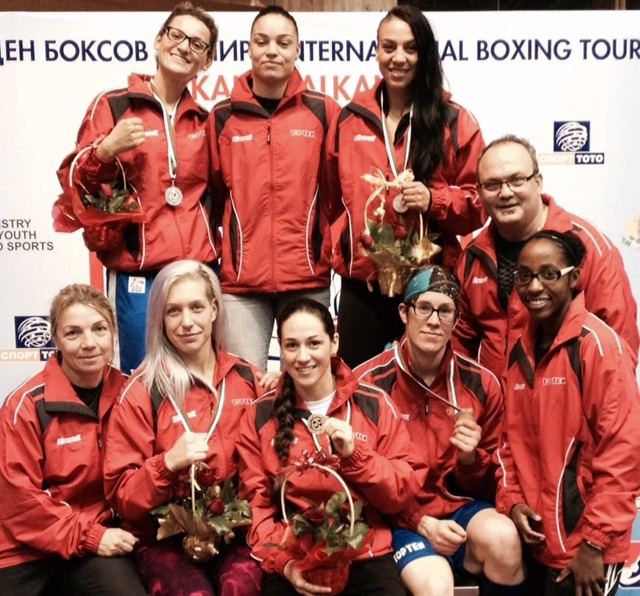 Boxing Canada sent 7 members of its women’s national team last week to Sofia, Bulgaria to compete in the Balkan International Boxing Tournament hosted by the Bulgarian Boxing Federation. The Balkan International Boxing tournament had 135 boxers from 24 countries in Elite, Youth, and Junior categories. Our Canadians were remarkable not withstanding the solid performance by the Italians who qualified 7 athletes into the semi-finals. With 5 of our women into the semis and a count of three (3) bronze medals by Sabrina Aubin, Jessica Camara and Myriam Da Silva, one (1) silver by Sara Kali and a gold by Ali Greey, Canada defended our colors well on foreign soil. Mary Spencer and Caroline Veyre also competed. Having arrived only one day prior to their bouts, they unfortunately were not able to optimize ideal conditions and results. Caroline Veyre is now starting her preparation for the Olympic Qualifier in December.